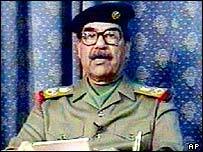 A recording purportedly of Saddam Hussein says the occupying forces in Iraq have reached "a dead end". The audio tape urging Iraqis to step up resistance against the US-led coalition was broadcast on the Dubai-based Arabic TV station al-Arabiya. "The US thought and made others think that they were going on a picnic to occupy Iraq," the speaker said. He also congratulated the Iraqi people on the occasion of the Islamic holy month of Ramadan which ends next week. The last tape allegedly from Saddam Hussein was in mid-September, and came after a series of recordings purportedly from the former dictator in the preceding weeks. In the latest broadcast, analysts said the speaker used some of Saddam's old rhetorical styles. The speech included indirect references to US President George W Bush and UK Prime Minister Tony Blair as "liars" and calling the White House the "Black House". "The land and fire of glorious Iraq that God has blessed with jihad because of valour in resistance... will swallow hundreds of thousands of troops that ... will never achieve their plans," the speaker said. At the start of September, intelligence officials in the United States said an earlier taped message was probably the voice of the former Iraqi leader. But Central Intelligence Agency officials in Washington said the poor quality of the recording prevented analysts from being absolutely certain of its authenticity. Saddam Hussein remains the most-wanted member of the former Iraqi regime still thought to be at large.